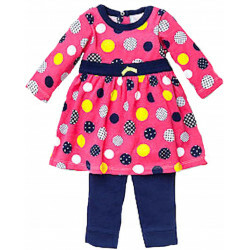 100% cotton knit with 100% polyester mesh overlay skirt dress and leggings by Little Me. The bodice is white with a drop waist and long sleeves. A ruffle of white knit and white mesh at the neck with pico pink stitching. Also found on the sleeves. Snaps at the back neck. The skirt is a lavender and pink floral print on a white background with the mesh overlay. Pink and lavender flowers embroidered on the chest. The leggings are pink knit. Sizes: 3, 6, 9 months.